We’ve had the wettest April in recorded history here in central Kentucky, so I’m a couple of weeks behind where I was last year at this time. 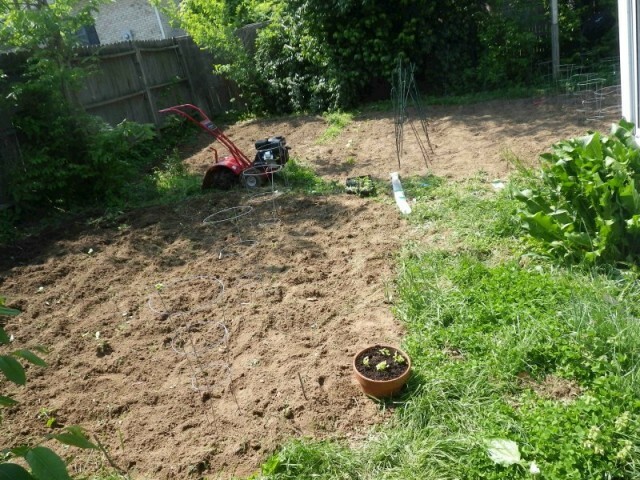 But, it’s also been unusually cold so it’s good that I couldn’t get out to the yard and get it tilled until now. I ran the tiller last week, and then this past Monday and finally got the seeds and seedlings into the rich Kentucky earth. In mid-April, I planted the plants I could go ahead and start. I had yellow squash, zucchini, cucumbers, two kinds of tomatoes, green peppers, watermelon, cantaloupe, pumpkin, and lettuce already growing that I transplanted into the earth once I tilled it. 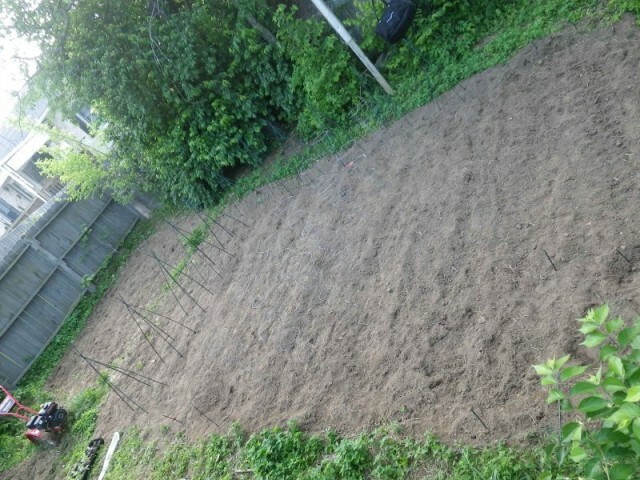 In addition to what was already growing, I planted corn, green beans, sweet peas, radishes, carrots, onions, spinach, turnips, and sunflowers. 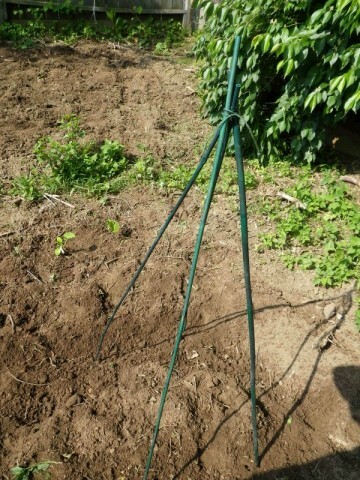 I read up on vegetables that grow on vining plants – cucumbers, green beans, gourds, etc, and decided to try a tee-pee method. You can get more plants into the ground in a smaller space. The plants will climb the tee pee poles and you can pick from them there. You place four poles equal distance apart in a square. 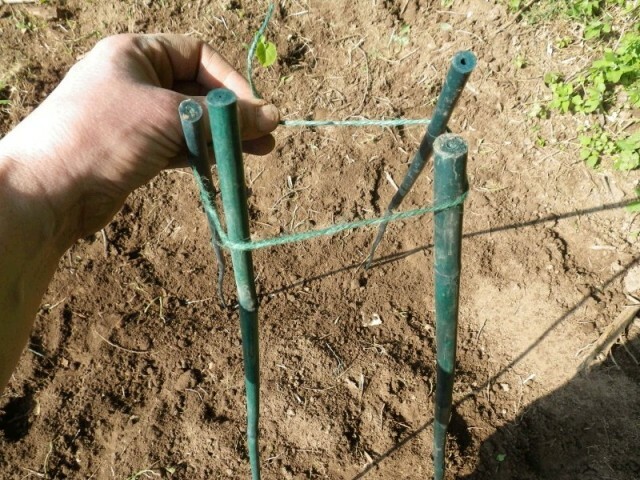 Bring the tops together with twine. Tie it off so that you form a tee pee. Plant a plant at the base of each pole. God’s design will take care of the rest. 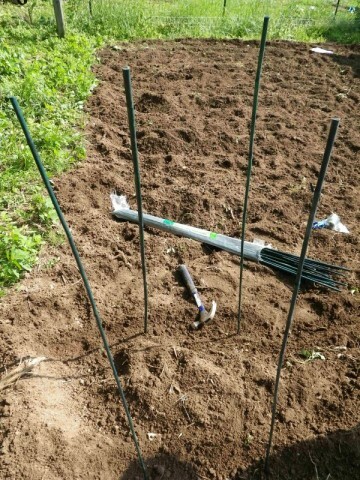 I also decided to cage the tomatoes this year. I usually stake them, but have problems with the staking. My parents have cages and their plants are huge and beautiful and easy to pick. Because I plant so many tomatoes, I’ve always avoided the expense, but determined that since the cages can be used year after year, it was a worthwhile expense. In my front flower bed, I am in the process of planting the herb garden. I have peppermint, basil, oregano, chamomile, thyme, sage, dill, parsley, cilantro, chives, and rosemary. 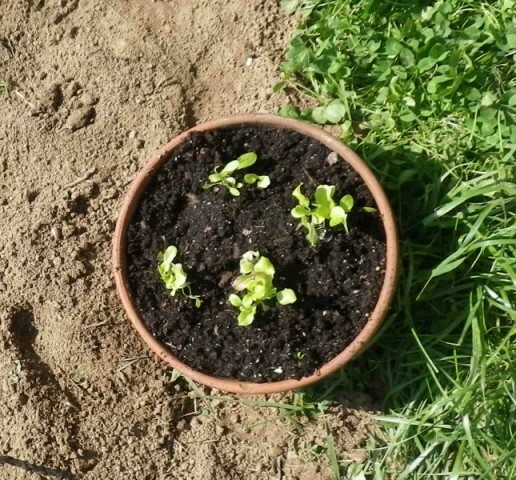 After my failed container gardening experience last year, I am giving lettuce in a pot another go, and that’s it. I may decide to try potatoes again, but I haven’t had the opportunity to read up on it like I wanted to, so I may wait until next year. I also have one more strip of earth that gets a strong afternoon sun. I’m considering turning it into a lettuce garden. 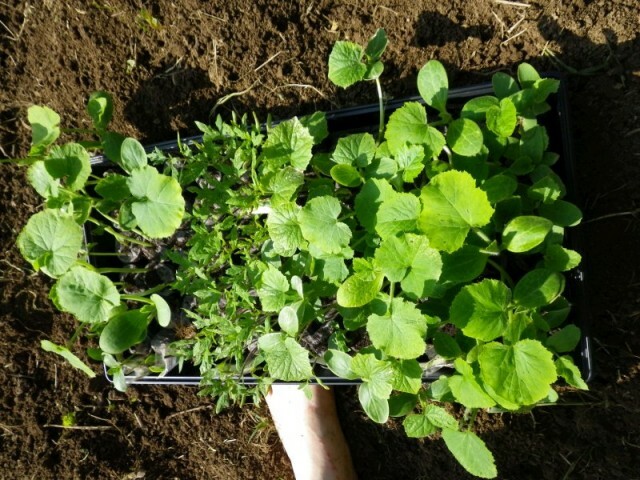 Have you been able to get your garden into the ground this year? 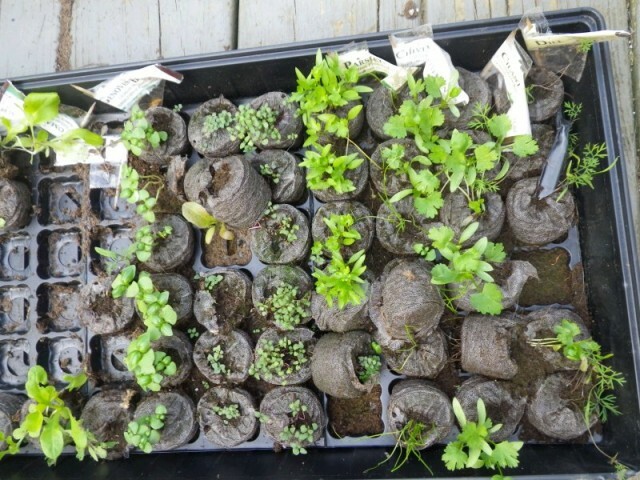 Do you have seedlings growing? What are you trying new this year? Be careful with that peppermint – it grows like a weed and will take over your whole yard in a few years if you let it! 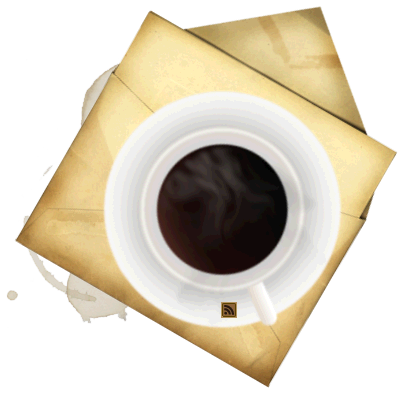 :) I’ve heard that if you plant it inside a coffee can that is submerged in the soil, it won’t be able to go past the borders of the coffee can. I’ve never tried this, as my one experience planting peppermint (several years ago) had me battling it back, pulling it out entirely, only to find it again 10 feet away, every year until we moved. It’s someone else’s problem now, lol. My mom had a great method for potatoes. She would plant the potatoes in the ground and place an old car tire around it. As the potatoes grows, she would fill the tire full of more dirt. 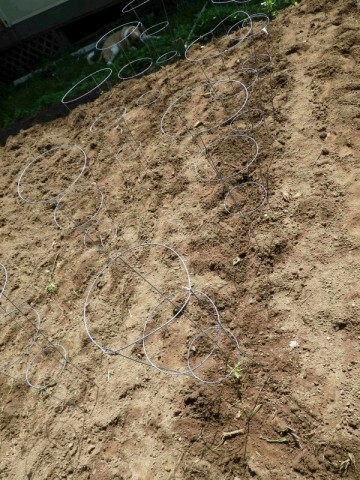 As the summer progressed and the potatoes grew, she added additional tires and additional dirt. she would usually have 5 or 6 tires stacked up by fall. In the fall she took the tires off and as the dirt falls away there are your potatoes. Most of them are above the usual ground level and easy to harvest. You can harvest lots of potatoes in a small growing space. Yes – they’re in an isolated bed. I actually pulled up ivy that was taking over and replaced it with peppermint. I figure – I’d rather battle back something that smelled good and that I could use. I also heard it was a mouse deterrent – but I haven’t followed up on researching that. The method I tried last year was similar. It didn’t work. The potatoes grew, but something flattened them. I had a giant garbage can full of empty potato skins. I don’t know if it was a pest or something environmental. 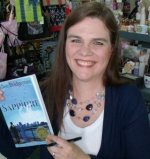 Hallee what happened to your container garden that made you feel that it failed? what did you plant in the pots? I am trying potatoes in a tub this year. Your lettuce should do well in a container. 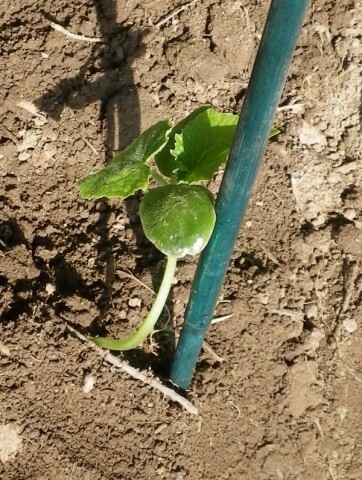 :) Let me know how your teepees work for your cukes-I trellis mine so that they are not in the dirt. Happy gardening! I live in Northern KY and the rain was just terrible! I didn’t think we would ever see the sun again! Our garden is just now recovering. We had stuff planted before all the rain and we just finished up the other night.